Developing internal audit as an aid to top Defence management. Providing objective assurance to national oversight bodies. Helping our clients improve systems to achieve goals with efficient, effective use of resources and dependable internal controls. Our vision is to contribute to national development by conducting internal audit of Defence Pro duction units and Defence Procurement agencies in line with the best national and international practices. Our Mission is to ensure timely & correct payments to Pakistan Armed Forces with Real Time Accounting and Auditng system. Our Mission is to ensure timely & correct payments to Pakistan Army through regional Controller Offices (CsMA). 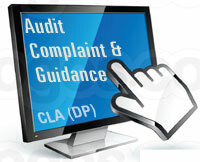 Audit Complaint & Guidance Desk has been established in Office of the CLA (DP) Rawalpindi in line with instructions of MAG to address queries and complaints of our valued clients. Providing annually an assessment on the adequacy and effectiveness of the defence production organisation's processes. Copyright © 2014-15 Controller Local Audit (Defence Production) Rawalpindi, Pakistan Military Accounts Department.